In a previous article, we discussed the inner workings of PDM versions. In a nutshell, versions are the way PDM tracks the changes to individual files. Every time we make an official change to a file, a new version is created and added to the file’s history. The good news is that the system handles versions for us automatically. If you want to know more about versions and how they work, check out our last PDM 101 here. People often ask if file versions and file revisions are the same thing. In some other systems, the term is interchangeable. That means whenever a change is completed by the user the file’s revision ticks up. PDM systems that use a process like this can cause unnecessary revisions. Or, even worse, files staying out for change indefinitely, because the user does not want the revision to change. This increases the risk of file changes being lost, or can cause delays in updating other dependent designs. With SOLIDWORKS PDM, the file version and revision are related, but are not the same thing. 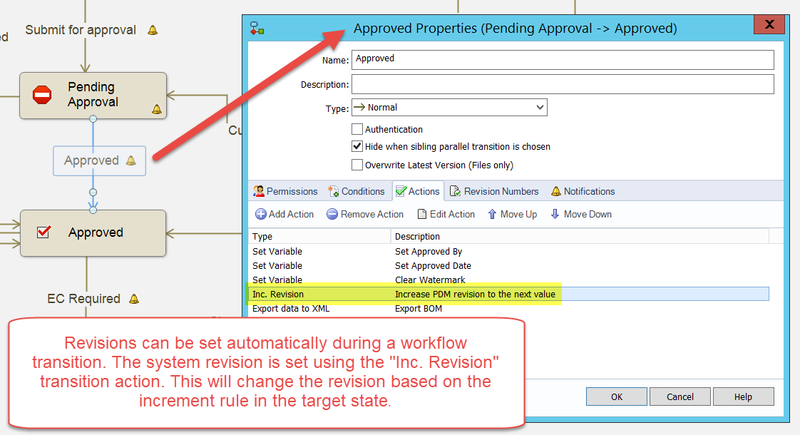 To put it simply, the PDM revision is a label applied to a particular version. A file can go through hundreds of versions and never be an approved revision. The revision stamp is only applied if we tell the system to set the revision. 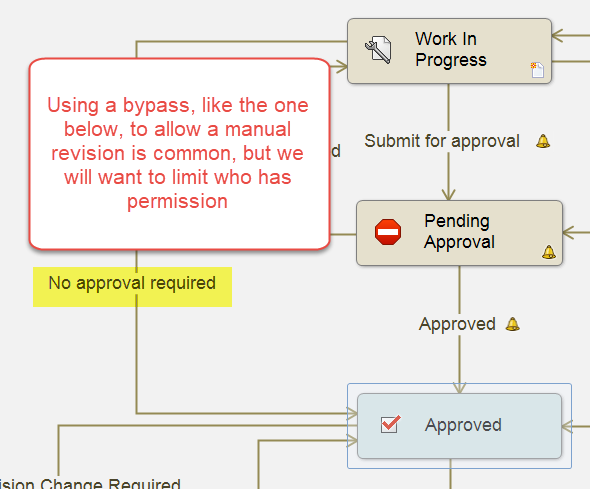 This can be done in 2 ways, manually – based on user permissions or automatically – based on a workflow process. Let’s explore both methods. You can easily set revisions manually using the right mouse button menu. 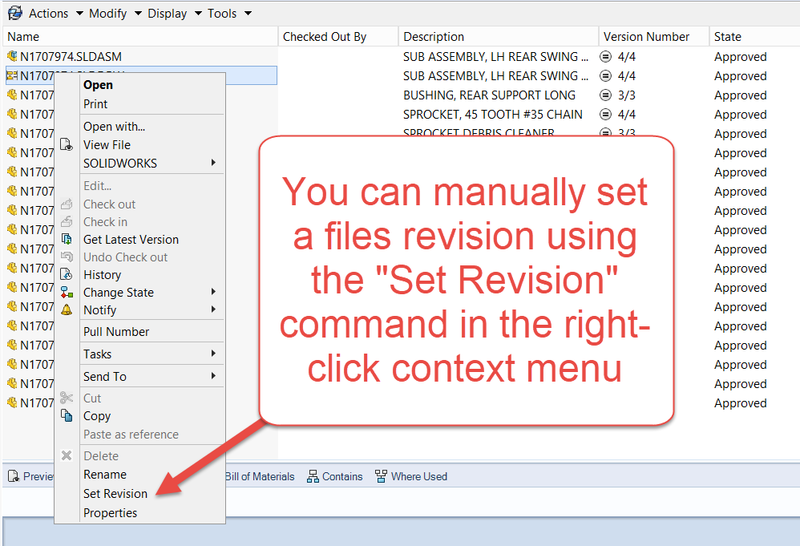 If the file you have selected is assigned to a workflow that has an assigned revision, you can pick the revision level from a dropdown in the set revision dialog window. You also have the opportunity to set the revision property for that file so it displays correctly on the card. You can do this for one file, or multiples, depending on your selection. The only downside is that you must select the revision value for each file independently. 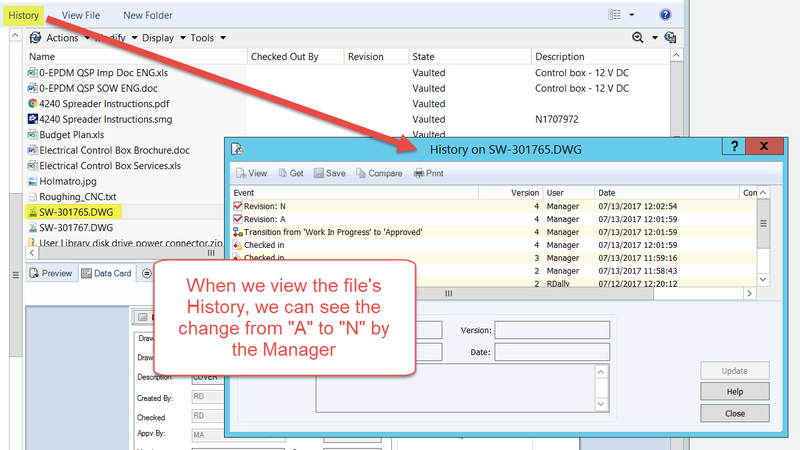 If you would rather not think about what the next file revision should be, you can set the revision automatically using the PDM’s workflow feature. The requirements are similar to setting the revision manually (the file must be in a workflow state with an assigned revision scheme). 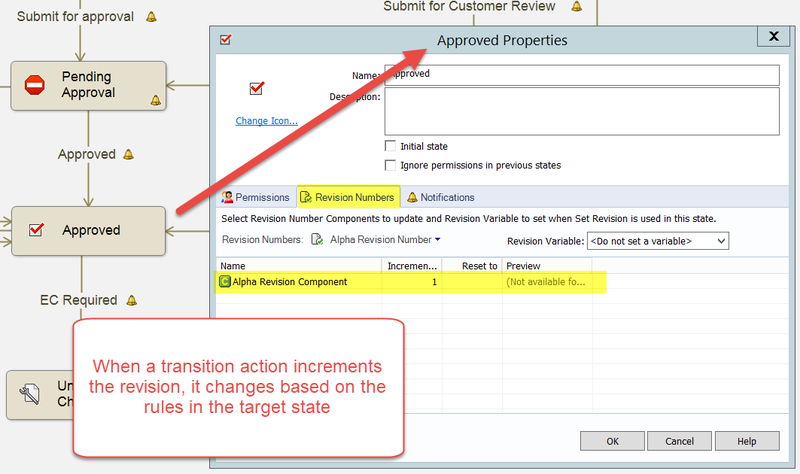 The difference is that the revision can both be incremented (move from ‘A’ to ‘B’) and set (Update card to show ‘B’ in the revision field) based on transition actions (Selecting ‘Approved’ to change the file’s state). Which one makes sense for you? Most people choose automatic. 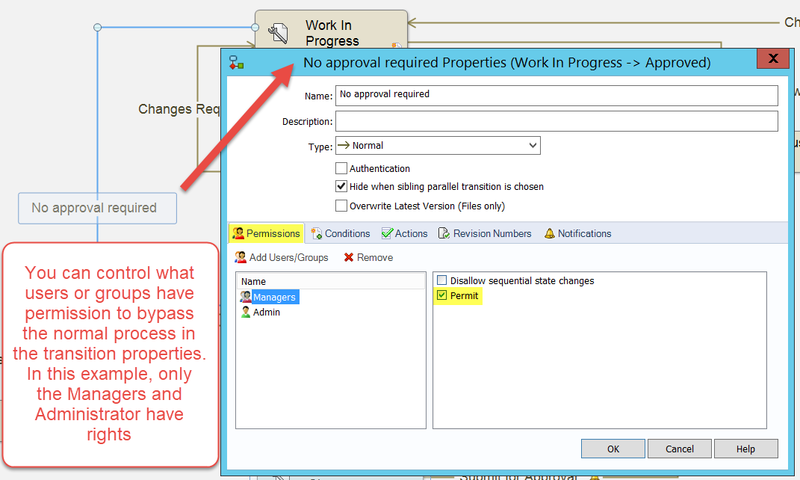 Since SOLIDWORKS PDM allows you to configure just about any revision style to match the grand majority of revision schemes, it makes sense to just let PDM decide based on the type of change. Some people do need to use a manual process because their revision style does not follow a standard schema, or they have a high level of “legacy” files that have an existing revision. For example, if you have a DWG file from many years ago that is at rev ‘N’, it is easier to set the revision manually rather cycle the file from rev ‘A’ all the way to ‘N’. While this may be the exception, rather than the rule, it makes sense to make manual and automatic methods available when you are dealing with new and legacy files. We have also seen unconventional revision schemes that include non-sequential values, where the only option is to have the user make the selection. There is also risk to making the system too open. Most people when presented with a problem will take the easiest path, and that might not always be what’s best for your company. Manual methods of setting the revision often bypass approvals that would normally be required. We have seen this abused by users when they want to keep revision changes under the radar (The old “That’s how I have always done it” reasoning). Preventing unauthorized changes is typically one of the key reasons for implementing PDM in the first place, so we want to make sure that we keep this to a minimum. This can easily be done by limiting who has permission to bypass the normal procedure. Determining which method to control the revision of your files is just the first step. Beyond this, you may need to decide what kind of revision scheme you want to use. 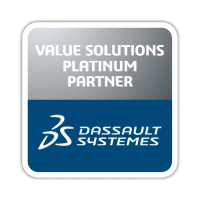 SOLIDWORKS PDM gives you the flexibility to use conventional or custom revision schemes based on your current or future system. We will dive deeper into common revision styles in the next PDM 101. HELP! I have lost my references!